From the creator of the beloved Large family comes a sympathetic—and simply hilarious—look at a toddler’s grocery-store tantrum. Oh, how this book made us all laugh by how much the grocery store meltdown rang true! Although Brie is FINALLY past the so-called ‘terrible twos’, going to the store can still be a lesson in patience for a preschooler who wants to touch and try everything. While grocery store meltdowns are mostly a thing of the past, I now have a three year old who insists on wearing the same skirt and pink shirt every day for school or she will get upset. Dealing with an upset three year old at six in the morning as we are rushing to get ready for work is tough, but it’s better than seeing your child have a complete meltdown in front of strangers, amiright?!? In Meltdown, Mom Bunny takes little Roxy bunny to the grocery store to go shopping. “Roxy can help Mommy,” she says cheerfully. While Roxy starts off trying to be helpful and then she begins to squeeze food bags and knock cans across the floor. “That is not being very helpful, Roxy,” Mom reminds her as Roxy goes back in the grocery cart. Then they pass the bakery where a certain piggy-face cake proves to be too much for Roxy as she proclaims in a VERY LOUD VOICE that she ‘WANTS THE PIGGY CAKE!” It ends with her mom leaving the store, covered in cake, and buying a minimum amount of groceries. Once home, mom asks Roxy if she has anything to say to her, to which she replies, “Can I have piggy cake, PLEASE?” HA! 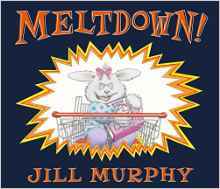 With the signature humor that made Five Minutes’ Peace a classic, Jill Murphy escalates a toddler meltdown to its comical breaking point, leaving readers laughing and heaving a sigh of relief not to be driving (or riding in) that grocery cart. Realistic and hilarious (because it’s not me! ), this is a must read for our littles and their big sisters who think it’s hilarious! About the Author: Jill Murphy has written and illustrated several award-winning picture books, including All in One Piece, which was highly commended for the Kate Greenaway Medal, and Five Minutes’ Peace. She is also the author of the Worst Witch chapter book series. Jill Murphy lives in Cornwall, England. ← The Original Whiffer Sniffers!